2 years ago I build an awesome SCHS base for a greenhouse. It is only small- 5m by 2.6m, in an urban garden. This was two years ago- and I have complete decision fatigue from trying to work out how to build the greenhouse to go above it. - be able to hang a hammock inside! It isn't only a greenhouse, it is a space to be nearly-outdoors when the weather here is rainy, as I like being outside. - season extender- I want to start my seeds off earlier and grow them on later in the season than I can outdoors. - not be massively expensive, my budget is probably about £1K. - has to buildable largely by me, on my own, in a year of weekends. I can draft in some friends for a bit of heavy lifting help, but mostly it'll just be me. Limited access, no machinery. Hired help fine if within budget, but that is unlikely. - Needs to fit raised beds in- can't grow in crushed bricks. - Be pretty enough that no one complains about it- urban environment and nosy neighbours. Building control also say I can't go over 2.5m in height. - Have a cleanable roof! Lots of trees round here- I'll need to clean it regularly. The steeper it is, the less I have to clean. I don't have enough room for cob or straw bale buildings- I'm up against the neighbours fence as it is. I put in concrete pillars every 1.5m down the 5m length of the greenhouse up to ground level- this is the 'solid structure'. I don't think I could build brick walls or anything on the 'disturbed' earth- though it has now been sat for 2 years. The undegrround bit is insulated. Cheapest option- polytunnel. Thermal efficiency is rather pants. I'm not convinced they're solid enough to hang a hammock from. Next option- buy a greenhouse (glass or polycarbonate)- just over £1000 I think. Hard to put raised beds in. Custom-built greenhouse- waaay out of my price range. Though really beautiful. What I want to do- custom build of an insulated timber frame back (north side), and a polycarbonate conservatory roof and front windows. Would cost less than £1000, but I'm not convinced i could build it myself. Whilst I can screw things together the joinery of such a building seems a bit too difficult for me. Self supporting alu roof? Or alu on timber roof? How to build this with a ladder and just me? Hmmm. Any other options or ideas? Words I can google to find out about building techniques that might be useful? General help on making an actual decision? Stories of building ambition or failure? I made a sketch (without looking at your base structure, but it looks we had the same idea), is that what you had in mind? My SCHS comes up to ground level- so the whole greenhouse structure including beds has to be above ground level. I was thinking of a dual pitch roof- because I'd get more headroom (I want to grow tomatoes in the front bed, a peach tree and climbing things like cucumbers in the back bed). 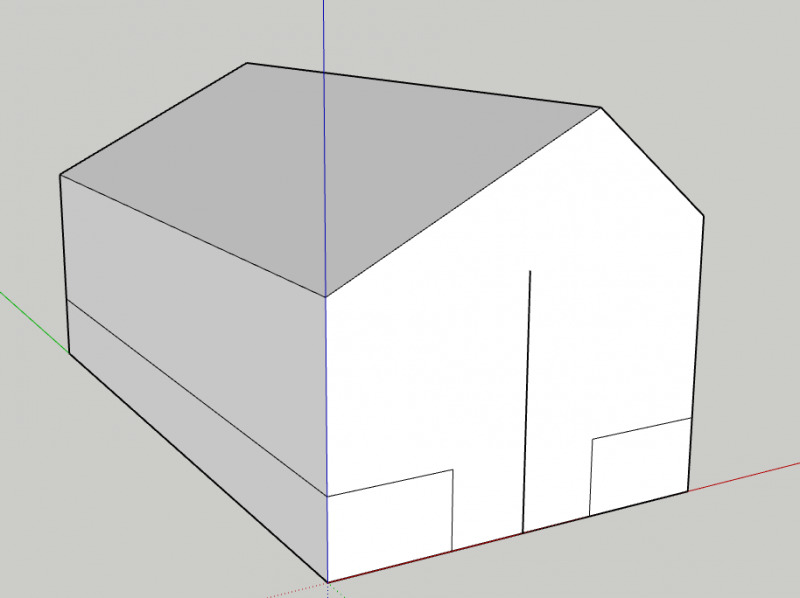 I realise this is much more complicated though, so I should probably stick with a single pitch roof. But then it is difficult to get headroom and a steep enough slope that the leaves don't accumulate on it. I was hoping for 0.5m high beds, 0.8m wide or so. The single line in the 'doorway area' is my height! Where would you buy green timber from? It isn't something the local timber yard carry (I've asked before- had grand plans of building a proper timber frame at one point! ), and I don't know anyone with any land. There isn't a mill I know of either- the timber yard just buys stuff in and resells it. Vague shape-only drawings because I haven't worked out how to build much of it yet! About the slope and the height of the "lower wall": I'd set up a small test rig and try at what height you feel comfortable. The slope isn't that long anyway, so you can always remove leaves with a modified broom. Two fences- a 4ft fence on the north side (with a 6ft tall shed after it). And to the west side a taller 6ft fence. East side is open to my garden and where the door would have to be. South is the long side of the greenhouse- deciduous trees 30m away (to the south) but the best spot for sunlight in the garden! In the summer it gets sun all day- apart from an hour when a confier in a neighbours garden casts its shade. In winter when the leaves are off the trees to the south it gets as much sun as we ever get in this country in winter! The orientation sounds great. I am still not exactly sure why I prefer the single pitched roof. About green timber: We got some from a sawmill about 100km away. Maybe there is one close to you on this list? I don't think I could go below grade now- with where the pipes are buried I couldn't excavate without hitting them! I'd also prefer everything to be on the same level due to mobility issues with other family members- be a shame if they struggled to enter my greenhouse! How could I build a brick wall? I always assumed they'd need concrete foundations- and thought that the concrete had to go on 'undisturbed ground'. My ground has all been dug and put back- so not undisturbed. Although it has now sat for 2 years to compact back down. I could probably put concrete lintels on my concrete pillars and build a brick wall on top of that, for a dwarf wall for the greenhouse. None of those sawmills are near me Not a Midlands thing, it would seem. I've asked various people in my area- although we're a very industrial area- twas all for coal mining (and now mainly upvc and foam production)- nothing timber related. Doesn't mean I couldn't travel admittedly, but by the time I've rented a van and things it might not save me much money. Oh, I was thinking about "digging" with just hands. It isn't deep (in from the last picture) and once you found the pipes you can move them aside for a more efficient use. Sure, if a few stairs are not an option, the below grade idea is pretty much not an option. Brick walls: I have build a number of brick walls in the garden (a high one, a lower one) with just bricks. Ever so often, one brick is put with the small side facing outwards, connecting the wall with the soil behind it. The high wall is also slightly sloped inwards, so gravity holds the earth in as well. Plant roots between the bricks also act as "mortar". I hadn't considered that, and would certainly work for interior walls I think- just bricks, they're very beautiful. Not sure about the ones that will end up being the exterior of the greenhouse though- because the greenhouse would kind of be sitting on them. I think I'm worried that they would move. And when I say 'excavating' I do mean by hand (well, with a spade! )- not with a machine or anything like that. Consider that you can get too much sun through the roof in the summer and the winter sun is so low it comes in through the vertical south wall all the way to the north wall. So making a metal roof sloping to the north parallel to the angle of the winter sun is the most efficient. The north wall can be sheathed with the same metal roofing and the roofing can also be used horizontal as the outside of the bed on the inside of the wood frame. The inside of the beds can be made with hollow cement blocks or bricks with rebar driven into the ground to hold them in place. The south and east sides can be sheathed in the wavy polycarbonate. I would recommend making as much of the east wall able open as possible for the summertime. You would only need one rain gutter along the north side to collect the rainwater. The frame walls can easily be assembled on the ground using screws and then stood up on your pillers. You can even screw the sheathing on before standing them up on the north and west sides which makes them very stable. The sheathing can be put on horizontal instead of vertical which requires less cross framing and doesn't block the sun on the south side. The roof is slightly more difficult because of working from the ladder but you do it one piece at a time from west to east. They make metal tie downs to hold the rafters on each end. So you fasten one to the top of the wall on each side and then set the rafter in the slot and put a screw on each side. Do a second rafter the width of your roof panel and then cut and put cross framing for the roof panel in between by screwing through the rafter. You can then screw the first roof panel in place through its ridges into the cross framing. Then put on another rafter and cross framing which can be offset enough to put the screws through and another roof panel until you complete the roof. So much simpler that trying to make a peaked roof. Have been given a quote for a custom-built greenhouse- £15-16K! Which makes me more determined to build my own! 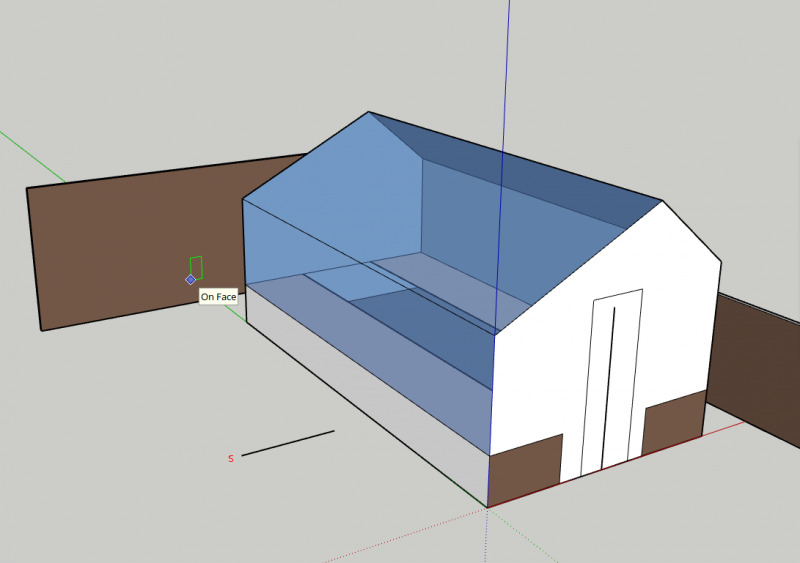 Currently I plan on taking your advice and building some example 'frames' in the garden, to see what kind of roof lean and headroom I can get away with. There's some good documentation of the construction, which looks quite a bit like your proposed design. 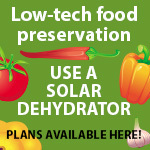 Have you seen the sunken greenhouse project on Homesteadonomics? Might be worth watching a few of the episodes in the series if you're looking for inspiration/options. 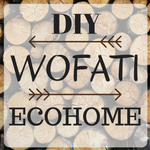 Since money is a concern for you have you researched recycled materials? I use my country's equal to the American Craigslist and I have scored some amazing finds - the best one to date being 2 complete double glazed top hung windows at the price of a case of beer. The top bit is a conventional greenhouse. 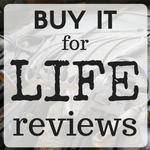 The kind you can buy at a DIY store or garden center. It's standing on a foundation of a concrete frame that supports the brick wall the greenhouse sits on.This is to give the house some height so I can have raised beds inside to make working there more comfortable. The square thing on the left and right are also brick walls with double glazed windows sitting on top. The windows is going to be removable so this part can be used as a cold frame at the beginning and end of the season and regular raised beds during summer. The wierd squares on the bottom right is a couple of stairs because the greenhouse came with a sliding door and I can't be bothered to change it to a side hung door. The bottom step is as wide as the greenhouse but the second step is only slightly wider than the door which creates two seats to sit and enjoy the everything. I will also need something to use as a barrier between the brick walls and the soil in the beds but that is a problem for later. It's become fashionable to build greenhouses out of old windows. It's all about the ones with multiple panes because the focus is on the estethics. These types of windows have become very expensive but their down side is they are also single glazed which is something to take in to consideration if you want to be able to lounge inside during colder days. However people have started to replace the windows on their 70's bungalow and these windows are double glazed. Perfect for your need to extend the season. This way of building is not for everyone because working with recycled materials means not always having uniform sizes to work with and also cleaning up the materials before they can be used which can take time. I bought 100 year old pine floor planks that I had to scrabe the dirt varnished/stuck in soap caught in the grooves off before it could be re-layed. It took a considerable amount of time but when building on a budget you can pay either in money and get less or pay in time and get more. My floor cost me 40 hours of hard labour removing and srabing the planks. 60 pounds for gas, 203 pounds for renting a truck big enough to fit them and 120 pounds for the planks. If I had bought the equivalent spuare meter planks new it would have cost me 2500 pounds for the planks alone. This may be a place to share my budget greenhouse idea. In addition to a greenhouse, we also lack a barn and are soon purchasing a walk behind tractor and implements and need somewhere to store it safely. We have discussed a shipping container as a reasonable and quick short term solution as we are just 50 minutes from a port, so reason costs and availability factor in nicely. 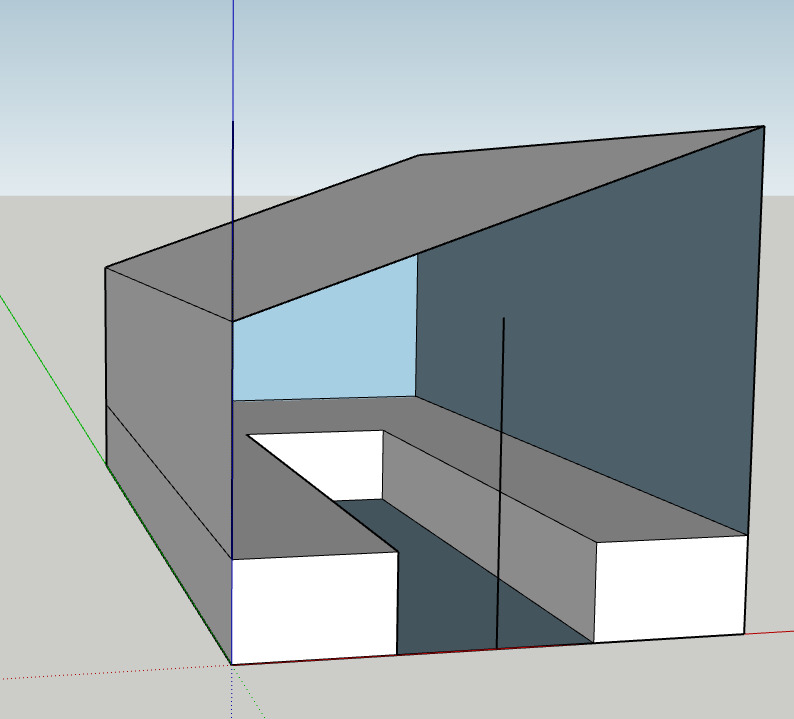 It occurred to me that said shipping container would make a solid backstop to a lean-to design for a flat greenhouse side, or half a hoop house. By excavating 4 foot trench down alongside the container would give adequate overhead clearance and put the seedlings at waist height. laminating 2x4s for a small timber frame?